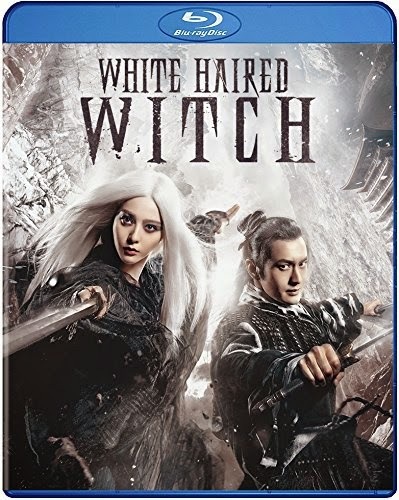 Based on a classic fantasy novel by Liang Yusheng (which was previously given a cinematic adaptation in 1993), White Haired Witch is a star-crossed love story that takes place near the end of the Ming Dynasty. The Imperial court is full of corrupt officials, and tyrants run the land at the detriment to the common people. When a sorceress named Jade Raksha (Bingbing Fan) attempts to fight back against the oppressors, she is framed for the murder of Governor Zhuo Zhonglian. At the same time, her lover Zhuo Yihang (Xiaoming Huang) is framed for the murder of another prominent government official in the infamous “Case of the Red Pills.” This should give them something in common, but there is a constant struggle between the two to trust each other, especially since Jade is accused of killing her lover’s own grandfather. In the end, they have nobody but each other to lean on in the battle against corruption. The film can’t seem to make up its mind whether to be a love story or a martial arts epic. It is possible for a film to be both, of course, but White Haired Witch seems to sacrifice elements of one for the other. They do not blend well together, perhaps because of a lack of chemistry, ridiculously CGI-ridden action and effects, or the combination of both. Either way, the end result is a bit muddled and consistently underwhelming. Part of the problem is the mere fact that these two characters are clearly the center of the narrative, yet still get lost often within the collection of convoluted sub-plots and supporting characters. This is one instance where less would have been more, both in the action sequences and the screenplay itself. No amount of flashy fantasy action can make up for the fact that we don’t care about the characters, and the end result just feels like a rehashing of better films. The Blu-ray release comes with a making-of featurette and trailer, though the only real reason for choosing this disc over the DVD must be the high definition presentation. It does not help make the film any better, but at least the CGI looks more fluid and realistic on Blu-ray.